Why Din Dayal Antyodaya Yojana (DAY)? To provide Skill training to poors in cities and villages. Unemployment gone, poverty gone. By 2020, developed nations will have shortage of ~57 million workers. Foreign companies will have to outsource work elsewhere. Ease of doing business- file clearance without suitcase-raj. Industrial location factors that we saw under Geography. Cheap but skilled labour force. (India will have ~47 million new workers by 2020). Therefore, success of Make in India, will depend on success of Din Dayal Antyodaya Yojana. Rural: starts from 2014 itself. Why? Skill training to poors in both cities and villages. 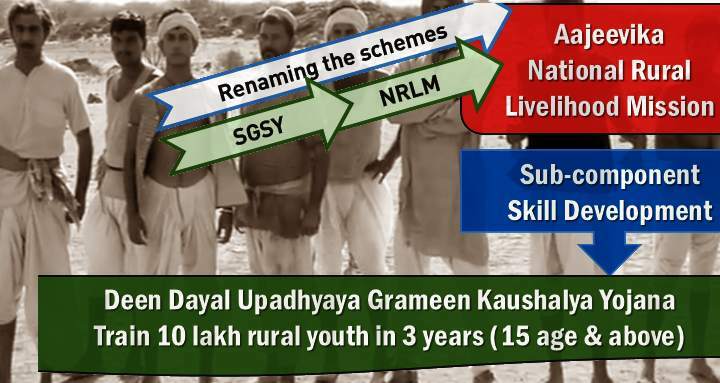 Deen Dayal Upadhyaya Grameen Kaushalya Yojana. SGSY=> renamed to NRLM => renamed to Aajeevika. 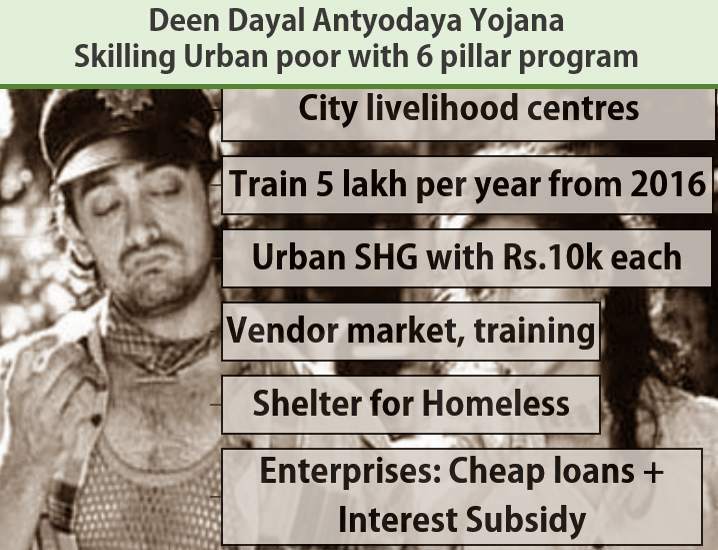 Aajeevika has a subcomponent for skill Development => It isrenamed as this Deen Dayal scheme. Rural folks- 15 years age and above. In the erstwhile Aajeevika skill Development component, the eligibility was 18 years. Government will setup training centres in rural areas. Training syllabus will be descend on international standards, so that rural youth can work in the foreign companies coming to India under Prime minister’s “Make in India” campaign. Special attention to physically disabled persons. Setup City livelihood centres with Rs.10 lakh grant. Give training to each urban poor via those centres. Government will spent Rs.15k-18k on training each of them. Yearly target: 5 lakh persons. Form Urban Self Help Groups (SHG). Give Bank linkage and Rs.10,000 to each such group. Setup Vendor markets, and give skill training to vendors as well. Construction of permanent shelters for urban homeless + other essential services. Help poors setup enterprises. Give them loan At 7% interest rate. NSDC will training to poor, according to market needs, via its training centres. NSDC will also help in identification of beneficiaries besides certification of training programmes through Sector Skill Councils (SSCs). Sector Skill Councils SSCs: They are industry led bodies. 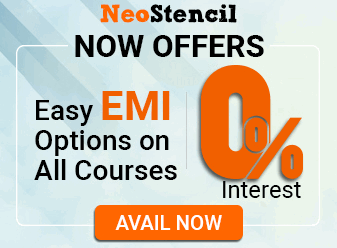 They define Standards and Syllabus for different training program in given industrial sector. NSDC will identify beneficiaries and design their training program with help of above SSCs. Thus, NSDC-HUPA tie up will help in speedy and result oriented implementation of Deen Dayal Antyodaya Yojana. Finally renamed to Aajeevika. May be the IAS in HUPA ministry doesn’t want to harass UPSC aspirants, therefore did not device a fancy name parallel to Aajeevika. It had a sub-component for training rural youth. Named “Aajeevika Skill Development Program (ASDP)” Now that sub-component is renamed into Deen Dayal Upadhyaya Grameen Kaushalya Yojana. I think sooner or later, Modi will shut down or subsume these two old schemes into the new Din Dayal scheme. Aajeevika Scheme worked fine for agarbatti, pottery, tailoring and other small business activities. More districts to get Cheaper SHG-loans. Additionally, Budget 2014 also announced “Start Up Village Entrepreneurship Programme” for rural youth. Just a quick reference table prepared from this PIB report. Beti Bachao Beti Padhao Department of School Education and Literacy (DSEL), supported the Ministry of Women and Child Development for roll out in 100 districts. UGC Junior Research Fellowship @ Rs. 8,000/–10,000/- per month. UDAAN (CBSE) to enable backward girls to move to post-school education in Science and Maths. PRAGATI (AICTE) Providing Assistance for Girls’ Advancement in Technical Education Initiativeone girl per family whose family income < 6 lakhs p.a on merit at the qualifying examination to pursue technical education. Saksham Scholarships to differently abled students to pursue technical education. Ishan Uday scholarships to students from North East Region whose parental income is below Rs. 4.5 lakh per annum for college education. Ishān Vikās Visit/Internship at IIT/NIT/IISER by students of NE region. to focus on the quality of foundational learning. Professors of IITs/IIMs/Central universities will offer online courses to citizens of our country. National E-Library Digital books to all citizens. Din Dayal Antyodaya scheme is meant for subsidized grains to widows and destitute. DDUAY falls under Skill Development ministry. Under its rural component, Government aims to train 5 lakh persons per year. DDUAY will subsume UDAAN scheme for J&K youth. And so on…Then you’ll be asked to idenify Which of the above statements are correct? Only 1 and 2; only 2 and 3; and so on. “Success of Make in India, will depend on success of Din Dayal Antyodaya Yojana.” Elaborate. 200 words. There are lot of things pondering in my minds after coming to this platform . so What is the best possible way to connect you ? There are lot of things pondering in my mind after coming to this platform . so What is the best possible way to connect you ? I want take all information .I have computer center & I want take this yojana . what is the main topic of deen dayal upadhyaya in the world? we want to apply for new projects running under DDU-GKY scheme. Kindly provide details of the same, from where we can get information about new projects running and application procedure of the same. sir rajasthan skill livelihood dev. cor. is run by construction academy2010. but stoped construction academy 2013 way. plz starting construction academy Jaipur jhodpur ajmer Bikaner bharatpur kota udeypur all seven dis. sir, i am in the business of skill development and want to run DAY project for rural/ urban bpl/ poor candidates. pl guide.